LAUSD charter schools on multiple sites have gone down. The number of LA Unified charter schools that will be splitting their classrooms across two or more traditional school campuses will drop by more than half this fall. According to district data provided to LA School Report, 63 independent charter schools will share space at 74 district school campuses next year, allotting 1,012 classrooms to charter schools. The number of charter schools that will share space on two or more traditional campuses is significantly down from years past, dropping to 8 this fall from 22 in the 2016-17 school year. The number of schools split on three or more campuses also decreased, going from 8 schools two years ago to 2 this year. JUST IN: Here are the charter school co-locations for the 2017-18 school year. However, one school will be split across four campuses. Citizens of the World 2 in Silverlake was assigned 43 classrooms on four campuses: Grant, Ramona, and Lockwood elementary schools and Virgil Middle School. That covers three different school board districts. But representatives from charter and traditional schools alike say the space-sharing process still suffers from many problems, including not having a transparent and open procedure that all sides understand. For example, it took LA School Report more than two months to get LA Unified’s list of the approved co-locations showing where charter schools will be sharing space with traditional schools this fall. Even the California Charter Schools Association has not been given that information yet. And although there is wide interest from principals, parents, and teachers, the district’s chart of co-locations is not available anywhere on its website. “The biggest problem is with the transparency, and I don’t see why all these offers and their locations aren’t on the district’s website somewhere,” said new school board member Nick Melvoin, whose District 4 has one of the schools where Citizens of the World 2 will use classrooms. “Prop. 39 really needs to be fixed, and there needs to be more transparency with the process and how the district handles these shared locations and the entire process,” Melvoin said. Steve Zimmer, whom Melvoin defeated in May for the District 4 board seat, also strongly agreed that the Prop. 39 system needs fixing. The co-location process is directed by Proposition 39, a state law that allows charter schools to use district facilities not being used for instructional or administrative purposes. Sometimes the number of classrooms requested by a charter school cannot be located on a single campus, so the school is split across multiple campuses. The district tries to find space at schools that are within one or two miles of each other. Splitting school campuses on multiple sites can hurt charter schools’ enrollment, which is what happened at Clemente Charter School. Principal AnnMarie Smith had predicted the loss when her school was split among three elementary schools: Heliotrope, Holmes, and Fishburn. And Jon Host, chief operating officer at Equitas Academy Charter Schools, said split sites means extra costs for safety officers, delivery crews, parking lots, and administrative staff. “Having the school on multiple locations makes building a cohesive community very difficult,” Host said. The district is trying to eliminate the multiple-campus co-locations, according to both the charter division chief, José Cole-Gutiérrez, and the facilities chief, Mark Hovatter. Parents protesting at Arminta Elementary, where a charter school was allotted space but didn’t take it. “We know this is difficult and disruptive for the schools, so we are working with them every way we can,” Cole-Gutiérrez said. He said this year will be better because multiple-school co-locations are down, but he said he regrets that one school is still on four separate sites. The California Charter Schools Association, which has won a lawsuit against the district and continues to closely monitor the Prop. 39 allocations, maintains that the system is still woefully lacking. A spokesperson for the charter group said that many charter schools have given up asking for space with the district and that many schools accept far fewer rooms than they actually need. CCSA said the number of charter schools requesting space remains about the same (generally between 92 and 96 schools a year ask for space). This year, 94 schools requested space at district schools, and 63 of those are on the co-location list for the fall. For the others, either the district didn’t find enough space or the charter schools turned down what the district offered. The charters ask for space in specific areas but not at specific schools. The district then locates spaces at schools that don’t have full enrollment and offers them to the charter schools. If the district can’t put all the requests in one location, they try to find spaces at multiple sites within a mile or so of each other. In 2016-17, there were 228 independent charter schools in LA Unified serving 107,000 students, or about 16 percent of district enrollment. The district is projecting an enrollment increase of 4,089 students for independent charter schools this coming year. Co-locations are difficult for the charter schools to manage and frustrating for the staff and families at the traditional schools. Protests, sometimes organized by teacher union members, were at an all-time high this school year, according to district staff, school board members, charter school leaders, and parents throughout Los Angeles. 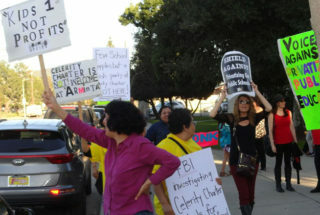 Protests erupted this spring at Arminta Elementary when parents heard that Celerity Cardinal Charter had been offered five classrooms at the school, which is a block away from Celerity’s current location at Sun Valley Middle School. Parents were angry that Arminta’s library would have to be moved so the classrooms could be contiguous and that they would lose their computer lab. Celerity eventually decided not to accept space at Arminta. Parent Richard Valdez said Arminta parents and the principal found out at the last minute about the offers to Celerity and said the process needs to be made public. 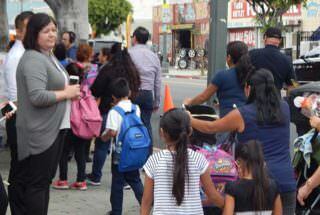 Equitas CEO Malka Borrego, left, watches protesters walk past her school. CCSA stated that if every step of the process were more transparent, there would be fewer protests and disruptions at the schools. The LA teachers union, UTLA, posts a list of school sites where charter schools may be co-located and includes organizing information. UTLA President Alex-Caputo Pearl attends some of the protests, including one at Arminta. Malka Borrego, CEO of Equitas Academy, faced 13 UTLA-led protests this spring. Equitas last fall had requested 10 classrooms and two administrative spaces for the growing student population at Equitas Academy, and the district then offered it space at Magnolia Avenue Elementary School. But some parents and staff at Magnolia were forcefully fighting the co-location. Borrego said Equitas will move into the Magnolia spaces this fall. But some parents at the school said they were never notified that the deal had been finalized.